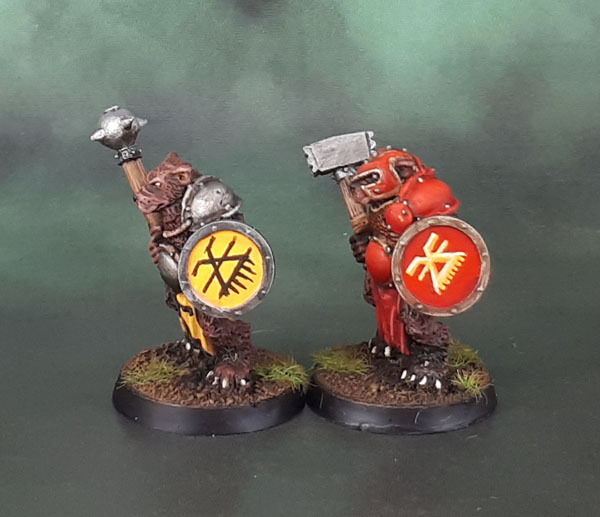 Realm of Chaos – Slaves to Darkness Beastmen V: Dog-faced Khorngor II (Neglected Model September ’18) | Azazel's Bitz Box. 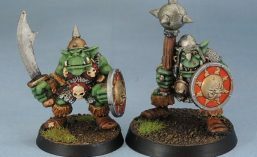 This entry was posted in Age of Sigmar, Beasts of Chaos, Chaos, Oldhammer, Realm of Chaos, Warhammer Fantasy - 9th Age and tagged Beastman, Beastmen, Beasts of Chaos, Jes Goodwin, Khorngor, Realm of Chaos, Slaves to Darkness. Bookmark the permalink. ← Mantic Terrain Crate – First bits of painted scatter. Ooh, those are awesome! 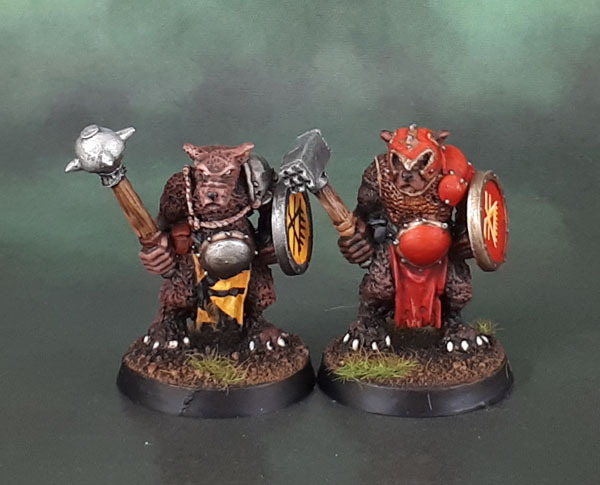 I really wish GW would start doing more variation in their beast-men, with dog-men and bear-men* and all sorts of other things, rather than just all being livestock-based. These ones are all cute and stubby and grumpy and I love them. Kind of remind me a bit of the Wolpertings from Rumo. *And -women. There’s really no reason for them to have a gender-segregated society. Even featuring a Bloodthirster on the record art! Yeah, I’d love to see a return to more variation in Beastmen. They do have the opportunity to do so even in a more uniform way (it if must be uniform) with the other three marked kinds to go with the Tzaangor. As for beast-wo-men, I do agree. I feel like we’ll be getting more of that as the “New”-GW continues to move forward (look at all the new fish elves and stormcast and gloom..haunt? It’ll just come down to when they’re doing new kits, I think. Thanks Ellen. I really need to do another one of the same design more neatly! I really like the partial mark on the yellow loin cloth. Very cool style choice. Can only echo what others have already said, nice work on those shields. Thanks mate. As much as I enjoy freehand, I got stuck on what to do with these shields for a few days. I’d love to see Jes come out of management and do some sculpting again for some of the new kits (ideally metal) without the need to sculpt models that would rank up nicely. That’s the only real drawback to many of these old-school models, and why a lot of the 40k stuff stands out more in many ways. Ooh, I like these guys. Nice work, and the shields look great! Looking great, Awesome work on that red shield design, Most impressed. Cheers for that. I’ll need to get a few more similar ones in to hone in the skills, I think. As happy as I am with it, the flaws stand out more and more, the more I look at it! Thanks Alex. Now to see if I can get the next pair sprayed today I can get the shields on and posted up in the next couple of days.. They are great- the dog faced look suits them. Thanks Pete. I’ll have to get a group shot of them again when I have some more completed. Those are great – especially the shields. I’m sure I’ve said this here before but seeing these really makes me wish that modern beastmen had a bit more variety to them. The new goats are lovely but wouldn’t it be nice to see a wider range of beasties again? Full agreement with you. I’m happy with the Tzaangor – as much as I’d have liked even more variety there, I’m happy to at least have the variants. I’ve been hoping for Khorngor and the others from the moment the Tzaan appeared – was quite disappointed to not get new Pestigor when we had all of those waves of Nurgle. Thanks KS. I really should try to get through the Beastmans and into my stock of the more impressive Goodwin Champions. 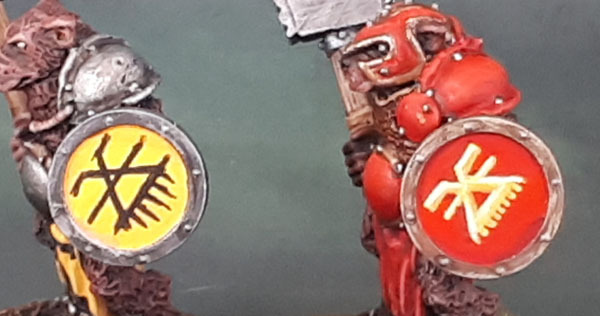 Love these – never seen them before and the shields and the doggies are excellently done. However, if you throw a stick or a ball, are they distracted? 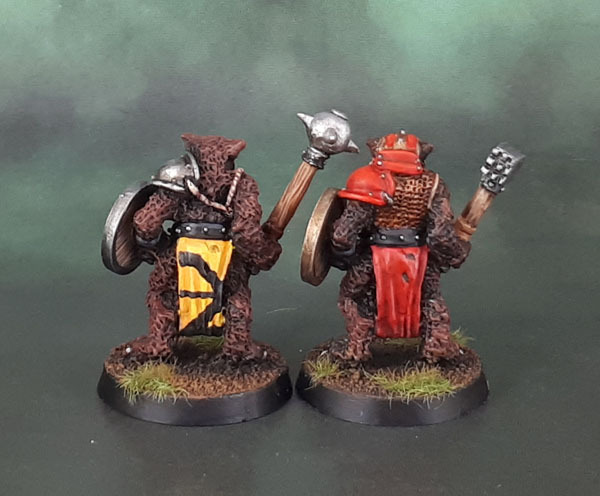 Pingback: Realm of Chaos – Slaves to Darkness Beastmen VI: Dog-faced Khorngor III (Neglected Model September ’18) | Azazel's Bitz Box.